This was taken at a dance, with Morris Scott and two dancers. Can anyone tell where this was taken and what year? Could it possibly be the old Social Club - the one before the current one - which was on land near the Academy. It looks like an old wooden building. I also have/had this photo. It was taken at the Tain dance in a back room/kitchen - the girls were part of a show band I think. Scott always enjoyed the company of the lassies! 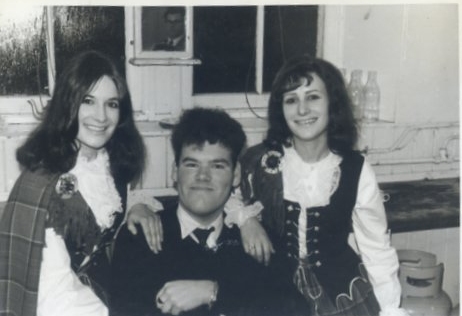 Having just checked my photograph album I can confirm the girls were with a band called The Jacobeats who were playing at the Tain dance on 13th Feb 1965. We took Morris 'backstage' to meet the girls. I also have copy of this picture (Judith Garvey nee Mckenzie). Nice to think of you, Elena. Hi Judy - great to see your comment and know you are still around. We often spent time with Morris didn't we? Would love to hear from you. Boy have we some catching up to do!! Hello Elena and Judith it was nice to see your names popping up on this great site. I'm not often up in Invergordon but think about yourselves and of course Teresa and Eddie as well when I'm heading up past the north end of the High Street going out to my mother's in Kildary. Hope your both doing and keeping well. Elena, pass on my regards to the rest of the family. I remember bands like the Jacobeats, Johnny and the Copycats, Lulu and the Luvvers and of course our own Jet Blacks all appearing at the Lower Town Hall, Tain. Aye and Morris was always there surrounded by a bevvy of good looking girls. I never had that luck. I never made the Tain dances - just missed out age wise. Remember Elena and Judy. Hear about Elena through Audrey and Eddie but haven’t heard of Judy in years. I was in school with her brother Martin and my mum Edna and her mum Brenda were friends. Would love to hear how everyone is with her. My name is Lorna Helby (nee Cameron) and I was one of the girls in this photograph. My sister Deirdre and I sang and toured with The Jacobeats during the sixties - the man in the picture is indeed Morris...we played at Tain a couple of times and Morris always came to talk to us. Both my sister and I now live in Australia, Deirdre in N.S.W and myself on The Sunshine Coast in Queensland. I would love to find some of the male members of the Jacobeats, so if anyone out there know where any of them live, can you please forward the info to me, I would really appreciate it!! Re Lorna's post - Brian Davidson who was with the Jacobeats is in Birmingham (I think) running a heating firm "Geothermal". John Stewart is a butcher in Banff.